The Beauty of Life: Beauty Question: What's Your Favorite Moisturizer? Beauty Question: What's Your Favorite Moisturizer? I'm suffering from a bit of a conundrum, fellow beauty chicks. 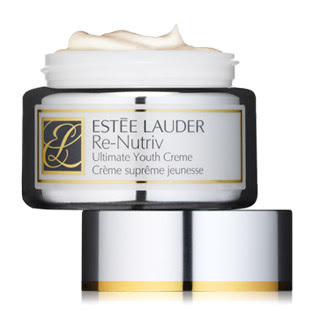 I just ran out of my favorite moisturizer and I'm hard-pressed to buy it again ... because, much as I love my Estee Lauder Re-Nutriv Ultimate Youth Creme, it retails for a whopping $250. I just don't have the cash to pony up for such an extravagance, though I know my skin might begin hating me. So my Beauty Question of the day is this. What's your favorite moisturizer? What can you absolutely not live without ... and why? And most importantly, how much does it cost? Let me know in the comments -- and it might just be my next purchase! You'll be doing this beauty chick a massive favor, believe me! pretty basic. the only moisturizer i've ever used in clinique's dramatically different moisturizing lotion. i think it retails for $23. it's not fancy, but i think it's awesome. Try the Kiehl's line of moisturizers - they are AWESOME! The Abyssine Cream (SPF 23) or Lotion (SPF 15) are FABULOUS, and for night-time I love the Cryste Marine line. Plus Kiehls sends out fab samples, w/generous amounts in each trial pack - free! My other favorite is "Hope is not enough" w/SPF - sinks right in! I love Eve Lom. It is the best. I love Clinique's Moisture Surge gel. It's intensely moisturizing but not at all greasy- it absorbs instantly and my skin feels like velvet. I've never used anything like it, or found an equivalent product in any other line. Definitely worth a try. I think it's around $34 a jar, and worth every penny. The best moisturizer I have ever used is by a company called Envision Beauty. It is calle The Solution. The founder, Kimberly Snyder, is a private yoga instructor for the stars, and is also a raw foodist who gets invited to celebrities houses to make them and their guests raw food. The Solution is made up of all natural ingredients and literally replaces your day cream, night cream, eye cream, and sooooo on! I read her blog for the raw food tips, and decided to try her moisturizer, and my skin has never been better. Plus, right now, she has a buy one get one free deal! It is 74 dollars a bottle normally. Her moisturizer, and her blogs are amazing! www.kimberlysnyder.net will get you there!!! Let me know if you try it!